You're interested in photography, and you want to buy a serious camera that will not only take good pictures but also help you learn this craft and remain a useful tool as you improve. If you're the kind of person who absolutely has to know everything and can't stand to have anything but "the best", I suggest you go over these review sites, read every single article they have and make your own opinion. On the other hand, if you have anything remotely approaching a life, you might be better of following the decision chart below. This way you'll chose your camera in three minutes, leaving you with all your remaining life minus 180 seconds to actually learn to take great photos — a much more rewarding experience. You fully expect that at some point in the future you'll own more than three lenses. You're interested in technically challenging photography, e.g. : concert photography, (indoor) sports, wildlife, birds, all of the above. You plan vacations to maximise photographic opportunities. You'd like to try taking unusual photos, e.g. of very small objects or with Fisheye or Tilt/Shift lenses. You actually know what Fisheye and T/S lenses are, or if you don't you plan on looking them up on Google as soon as you're done here. So here it is! 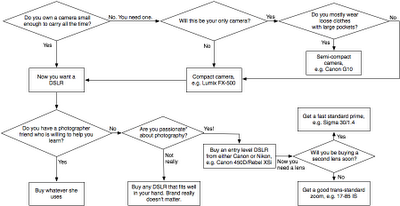 If you're currently on the market for your first (serious) camera I hope you find this chart useful. If you've already made that decision and have anything to say about any of the above, I'd really like to hear from you. In both cases, the comment form is there for you. Enjoy!